After a chilly month for job growth in December, hiring warmed up a bit in January. But not by much. 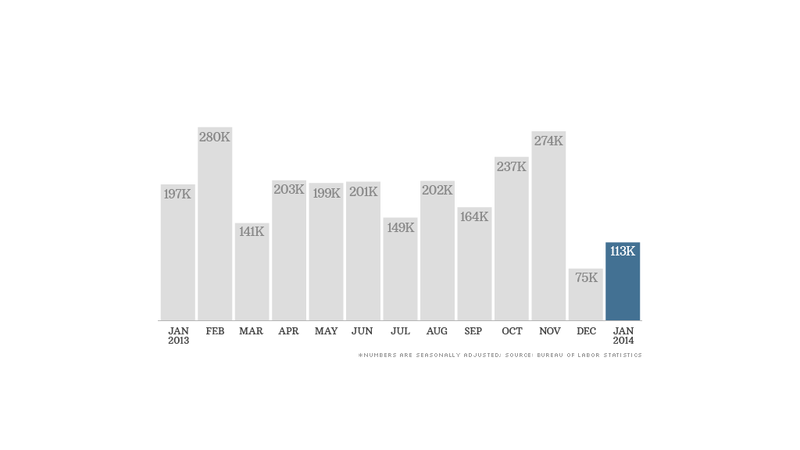 The U.S. economy added 113,000 jobs last month, according to the government. That's an improvement from December, but was far weaker than hoped. Economists had been expecting an addition of 178,000 jobs. They called the report "disappointing" and "weak," but characterized broader economic growth as "steady-as-she-goes." "The U.S. economy is very stable," said Julia Coronado, chief economist, North America for BNP Paribas. "2014 might not be a breakout year, but it's not a disaster either." Many economists had also been hoping that December's weak job gains would be revised much higher, as many experts were quick to write off the December report as a fluke. The number was revised higher, but only by 1,000 jobs to 75,000. Lowest unemployment in 5 years, but: The unemployment rate was 6.6% in January, as 10 million Americans were counted as unemployed. Overall, the unemployment rate has improved substantially since it peaked at 10% in 2009 and is now at its lowest level in more than five years. That said, much of the decline in unemployment has come for a discouraging reason: some Americans are dropping out of the labor force. As of January, only 63% of Americans over age 16 participated in the labor market -- meaning they either had a job or looked for one. Although there was a slight improvement in January, participation is still hovering around its lowest level since 1978. While some of the decline is partly due to baby boomers retiring, economists are also concerned about the long-term unemployed, who may be giving up on the job market altogether. Following the report, one of President Obama's top economic advisers, Jason Furman called the unemployment rate still "unacceptably high." About 3.6 million Americans have been unemployed for six months or more. Those who were relying on extended government benefits lost that lifeline in December. "These figures provide a stark reminder that despite the progress that has been made, the after-effects of the recession still linger and are creating hardship for many families," Furman wrote in a White House blog post. The Federal Reserve has been stressing that its stimulus policies depend on the economic data, and while it has been aiming for an unemployment rate of 6.5%, it's expected to distance itself from using that number as its main measure of the job market. "Using the narrow, widely reported unemployment rate alone could suggest a misleadingly optimistic state of affairs," Boston Fed President Eric Rosengren said in a prepared speech Thursday, ahead of the jobs report. Recently appointed Federal Reserve Chair Janet Yellen is scheduled to testify before two Congressional committees next week. Where are the jobs? Surprisingly, more than half of January's job gains came from traditional blue collar sectors. Goods-producing industries added more jobs than the services sector for the first time since 2005. Construction firms added 48,000 jobs and manufacturers added 21,000 jobs. The mining industry added 7,200 jobs. But that was one of few bright spots in the report. The health care sector cut 400 jobs -- the first month of job losses since 2003. Health care had been an industry with strong job growth throughout the recession. Professional and business services added 36,000 jobs, but a large part of those jobs were through staffing agencies. About 15,000 jobs were added at restaurants and bars. Sporting goods, hobby, book and music stores cut 22,000 jobs. Overall, the U.S. economy lost 8.7 million jobs in the financial crisis. As of January, 7.8 million jobs have come back, but once economists also account for population growth, they expect that it will still take years to get back to a pre-recession job market.